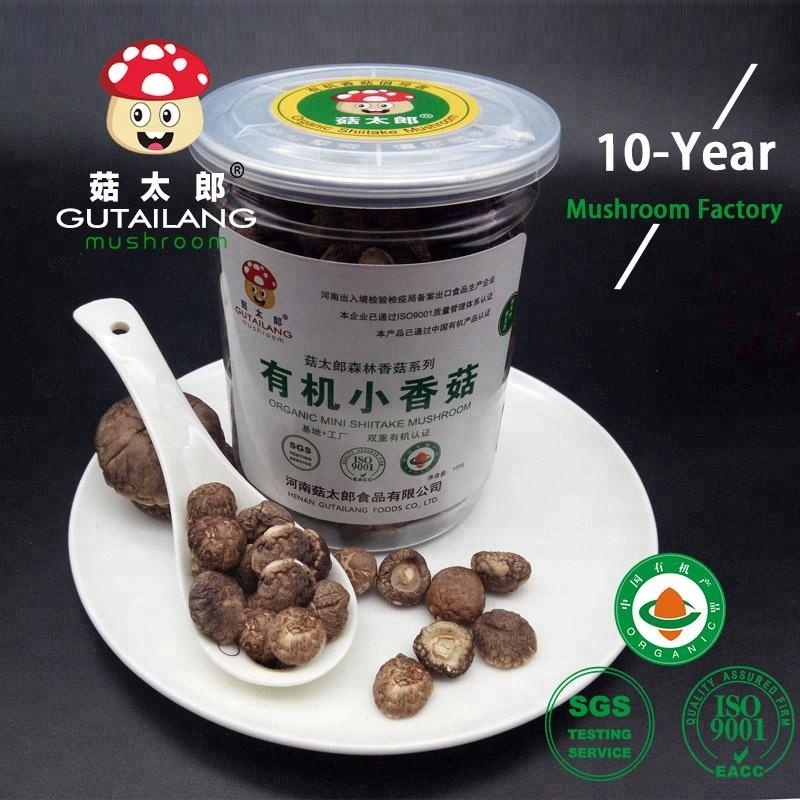 Best seller special for soup dried organic mini shiitake mushrooms grow in mountainous areas without pollution in Nanyang, Henan province. The surface colors are mainly light brown and dark brown. The bottom color of the folds is light yellow. The diamater is from 1.5-2.0cm as it takes only new-baby tender shoot shitake mushroom as materials. The taste and nutrition are especially good. It is special good for soup. You can soaked it first until it gets soft and then add them into soup or you can add them directly into soup just after washing. The soaked water is also Ok to add into soup as it will boom the soup flavor. We have entrusted SGS to specially conduct 194 kinds of testing on pesticide residue for the products that all of them conform to the requirements of European Union. Exactly safe! No carbendazim and other pesticides, qualified for the USA, EU, Japan and Korea markets. No adulteration of unsaleable stock as well as no worm-holes and mildew exist. Impurities are selected by manual and the fragrance is dense. Shipping: both by sea (FCL or LCL ) or by air is available. 9. 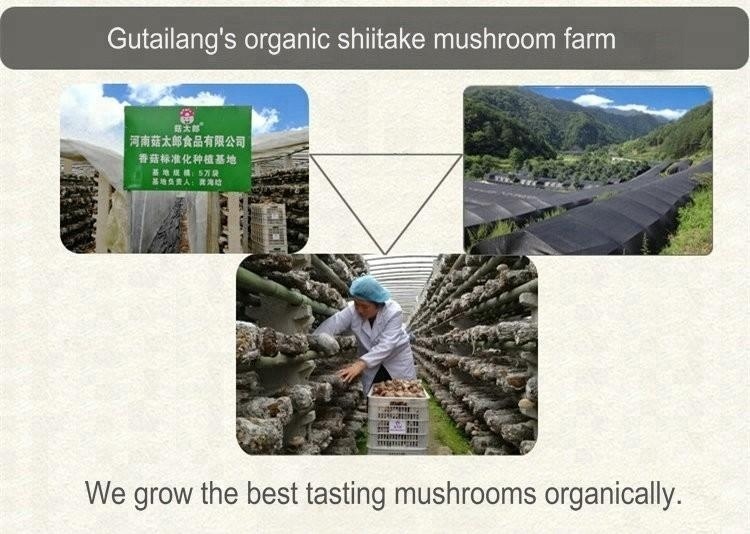 24-hour fast response and continuous after-sales support to our shiitake mushroom products. 10. 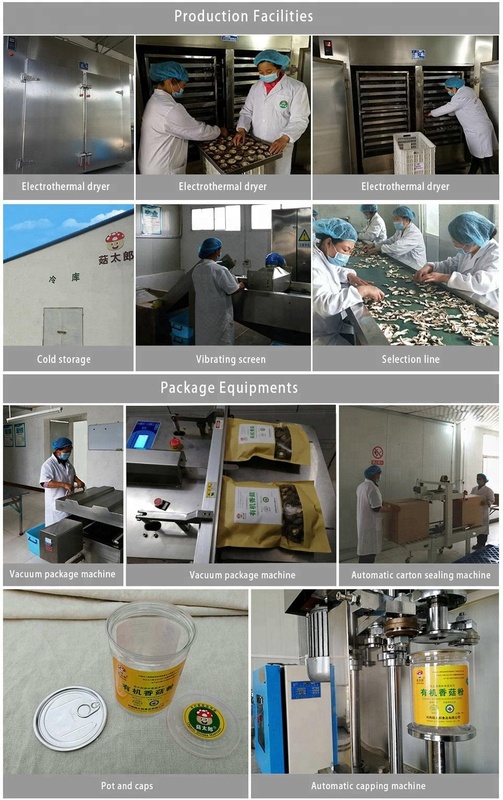 We provide shiitake product solution and technical support to customers. 1. Located in central China, the largest shiitake mushroom producing region in China. 2. Focus on shiitake mushrooms for 10 years. 3. Authorized import and export licence. 5. Organic Product of China. 6. With SGS test report, include 194 kinds of testing on pesticide residue for EU market. 7. Company founder returned from Australia with master degree. 8. Company founder worked as international business director in south China ten years ago. 9. Exported to the USA, Canada, UK, Spain, Portugal, Italy, Ukraine, Japan, Korea, Singapore, Thailand, etc. We are a pfofessional 10 year manufacturer of shiitake mushroom products, including dried whole shiitake mushroom, dried sliced shiitake mushroom, tea flower mushroom, shredded shiitake mushroom, shiitake mushroom cube, shiitake mushroom stem, organic shiitake mushroom powder, etc. 2. What's your minimum order quantity of shiitake mushroom? Our MOQ can be 500Kg for one product or 1000Kg for two or more mixed products. 3.Can you help design the packaging of shiitake mushroom? Yes, our package designer can design both inner & outer packaging as per your specific request. 4. What kind of certification do you have for shiitake products? 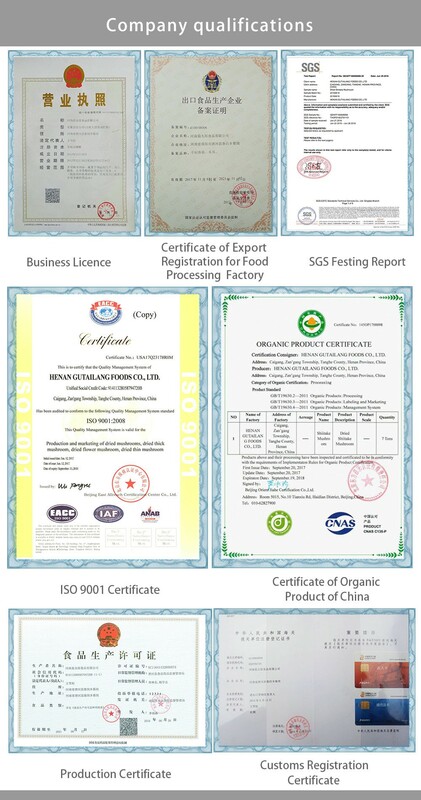 ISO9001, Organic product of China, SGS Testing ensured EU standard. 5. How can you guarantee the safety of your shiitake mushroom products? All of our products are from our self-owned or self-controlled mushroom cultivation base. The regular inspection on pesticide residues & heavy metals of raw materials ensure that only the safe & qualified mushrooms can enter our workshop. Apart from, the procedures of manual selection, metal detection and microwave sterilization guarantee that only conforming products can be shipped out of factory. 6. How many countries have you exported shiitake mushroom to? 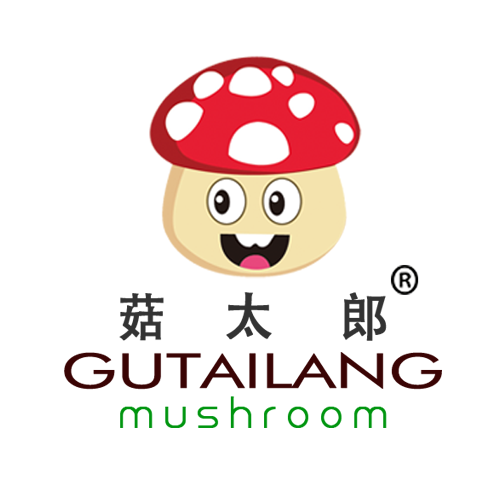 Gutailang mushroom products have been exported to the USA, Canada, UK, France, Spain, Italy, Portuguese, Ukraine, Japan, Korea, Singapore, Australia, Thailand, Hong Kong, etc. 7. Hong soon will you deliver the cargo? How long is the delivery lead time of shiitake mushroom? 8. Can I ask for sample? 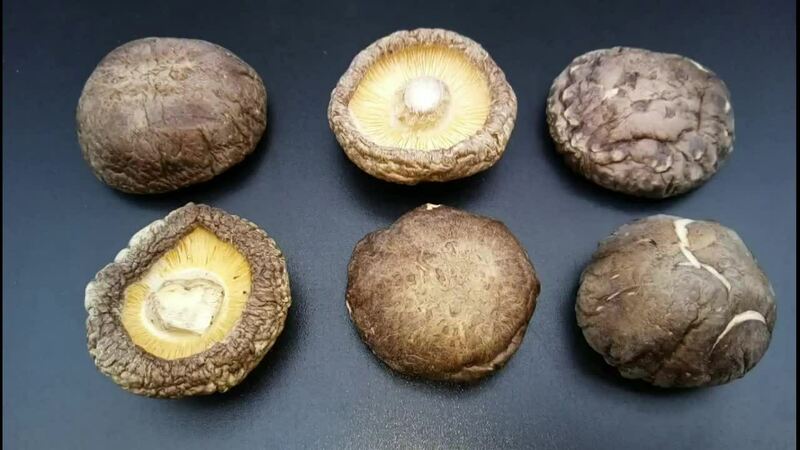 How can I get the sample of shiitake mushroom? Yes. The sample will be despatched by express courier, like DHL, EMS, Fedex, etc. Normally 3-7 working days depending on the different destinations. 9. How can I purchase your shiitake products? You can chat with our customer service online or send enquiry to Email: ivynan2008(at)126.com for detail communication. 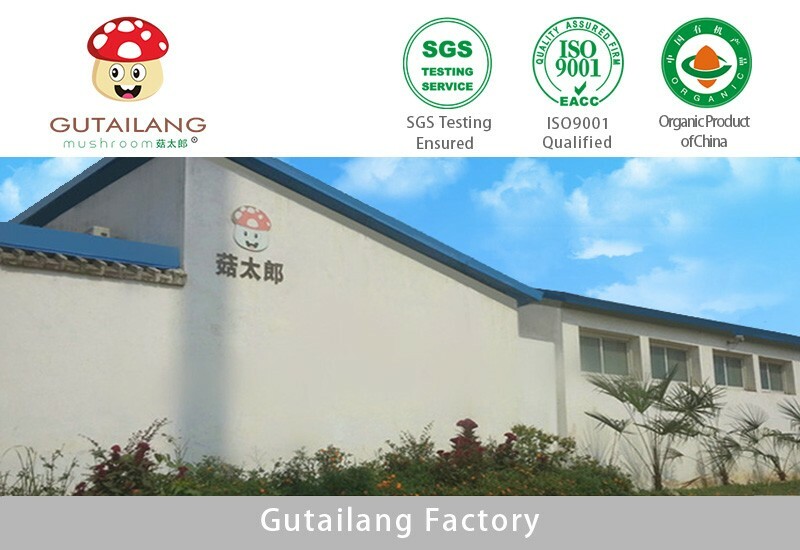 If you are looking for shiitake mushroom supplier, Gutailang is just waiting here for you. Contact now! The supplier is ranked number 6 by reviews data in Vegetable Products. The supplier is ranked number 12 by delivery data in Vegetable Products.